The relative motion of moon with respect to earth and sun give rise to different phases of illumination of moon from different geometrical positions. 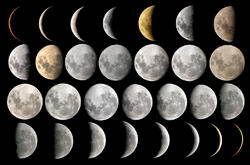 There are nine different phases of illumination of moon. They are named as new moon, Waxing crescent moon, First quarter moon, Waxing gibbous moon, Full moon, Waning gibbous moon, Last quarter moon, Waning crescent moon and Dark moon. Another important terminology in moon cycle calendar is blue moon. Since the time between two new moons is not exactly a month so after every three years there are two full moons in one month of the calendar. This second new moon in the month is known as blue moon. The most widely used calendar based on the phases of moon is the Islamic calendar or the Hijri calendar. Islamic calendar is only calendar that is purely based on the phases of the moon. The moon phase calendars of various years and their inferences by renowned astrologers can be checked online.